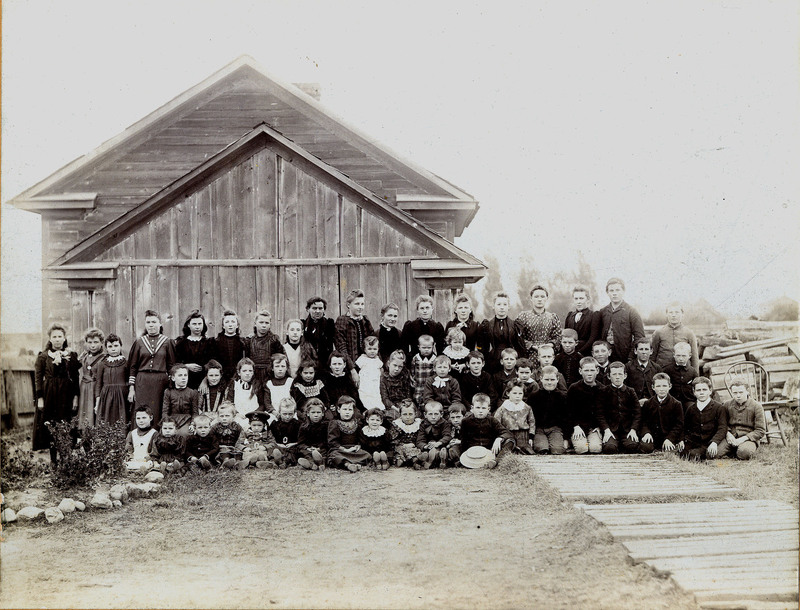 Breard St. School, which was established in 1868. This picture was taken in 1891 or 1892. It came from the Blain family photos of Helen (Maconchy) Blain. The names were supplied by Ethel (Todd) Campbell during the summer of 2000. Back Row (left to right): Tess Gibbons, Maggie Nesbitt, Adelaide Keaney, Katie Keaney, Unknown, May Neilly, Mary Edith Coulter, Reba Rothwell, Margaret Hanna McBeth (teacher), Belle Neilly, Josephine McGarvey, Georgina Doolittle, Carrie Neilly, Ida Rothwell, Annie Doolittle, Grace Coulter, John Willie Gibbons, Unknown. Centre Row (left to right): Ethel Keaney, Sadie Neilly, Bertha Neilly, Lila Hines, Cassie Roberts, Hope Gibbons, Myra Neilly (baby), Maggie Coulter, Sydney Jennison (baby), Urmey Rothwell, Emma Coulter, Fred Gibbons (baby), Billy Blain, Lou Neilly, Unknown, Unknown, George Andrew McGee, Fennell Rothwell, Harvey Jennison. Front Row (left to right): Maggie Keaney, Lucy Keaney, Chester Jenison, Mable Coulter, Edgar Neilly, Mabel Todd, Unknown, Minnie Neilly, Katie Gibbons, Nellie Couch, Elmer Rothwell, Wilford Neilly, Bob Couch, Unknown, Ernest Gibbons, Lewis Gibbons, Tom Blain, Eddie McGarvey, Unknown, William John Doolittle.